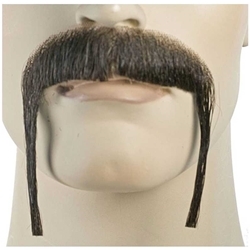 The Mandarin Chinese mustache is popular for Fu Man Chu, Sensi's, or other Asian characters. This mustache comes down over the lips and drapes over the edge of the mouth. This is the Human hair version and gives you the most realistic look and allows you to use any hair product including dyes that you can use on natural hair. The hair is attached to a full lace backing. extremely realistic and superb for stage, video, film, and closeup work. Please note that this item requires spirit gum to apply. We recommend our spirit gum and remover combo pack.